Windtubes are one of our most popular activities. 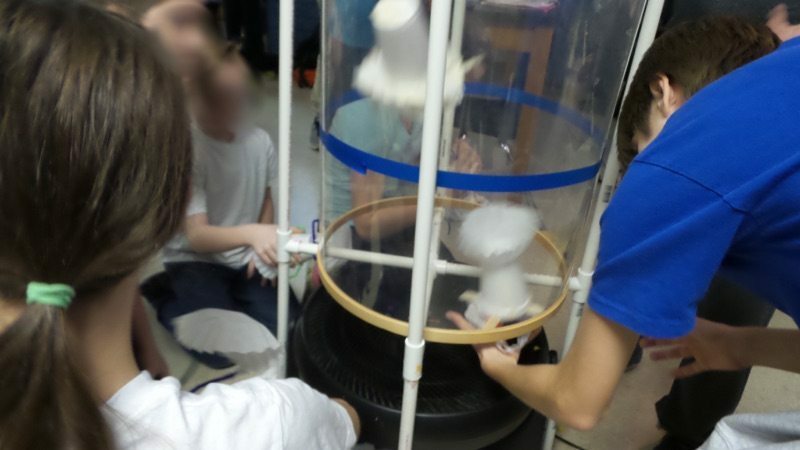 Youth can explore aerial dynamics as well as the impact air has on different objects. In this lesson, you’ll learn to construct your windtube and then explore a variety of materials and challenge prompts that have been tested with youth of all ages. This lesson streamed live on June 29, 2017 at 7pm EST but you can find the recorded session below! If you would like to watch a video of only the build instead of the entire webinar session, the build video can be found after the supplies section. We’ve kept the supplies for this project as minimal and accessible as possible. Much like the documentation station, the wind tube frame has gone through several iterations. We’re excited to share our current version, which is a nice medium between stability and accessibility. The parts for the frame and the tube are available through Amazon as well as local sources. PVC Segments: The PVC segments and joints can be purchased from a hardware store such as Ace or from a home improvement store like Lowe’s. When purchasing the PVC make sure to get the correct diameter pieces – sometimes the PVC sections are in a single container. You can read the diameter from the side of the PVC segment. Depending on the store, the staff sometimes provide assistance in getting / cutting the PVC segments. Update: We have greatly simplified the cuts! It now uses less PVC and the cuts are far easier now. Everything is 1/2″ diameter. The total is roughly 240″, so purchase around 20‘ of 1/2″ diameter PVC to be safe. Previously, the build required around 35′. We’ve revamped the design to increase the portability and reduce the PVC need. Honeywell HF-910 Fan: This is the fan that we’ve used in all of our wind tubes. It has a nice speed control, is durable, and also the fan’s angle can be adjusted. Acetate Sheet: This sheet forms the actual tube. This roll from Amazon provides enough acetate for two wind tubes, so you can either share with another educator in your space or know that you’ll have enough left to form another wind tube. Local art supply stores sometimes have this in stock. 18″ Quilting Hoops: You’ll need two hoops for each wind tube. These hold the acetate in its tube shape. You can often find these at local craft stores such as Michael’s or JoAnn’s. Make sure to use quilting hoops instead of embroidery hoops, as the quilting hoops are less expensive. If you’re going to check craft stores, be sure that the hoops are the 18″ size.